Student fees (which include tuition and other fees such as athletic fees, student health services and student associations) accounted for more than one-quarter (27%) of university revenues in Canada in 2016/2017, up from just under 20% in 2000/2001. New tables from the Pan-Canadian Education Indicators Program, which provides a statistical portrait of education systems in Canada, show that student fees are becoming an increasingly important source of revenue for universities in the country, varying by province. The increase in the share of university revenues coming from student fees from 2000/2001 to 2016/2017 was largest in British Columbia (+13 percentage points), Ontario (+11), Quebec (+5) and Nova Scotia (+5). In contrast, this proportion did not change in New Brunswick, and edged up in Alberta (+1 percentage point). Newfoundland and Labrador was the lone province to report a significant drop in the proportion of university revenues coming from student fees (-9 percentage points) over the same time period. In 2016/2017, Newfoundland and Labrador had the lowest proportion of revenues coming from student fees at 10%, reflecting a long-standing provincial policy to limit student fee increases. Undergraduate tuition fees account for the bulk of total university student fee revenues. From 2006/2007 (the earliest year available) to 2018/2019, both Canadian students and international students (who pay higher fees than Canadian students), saw average undergraduate tuition fees increase in most provinces. Increases in undergraduate tuition for Canadian undergraduates varied by province. From 2006/2007 to 2018/2019, they rose the fastest in Ontario (+38% or from $4,800 to $6,500), Quebec (+28% or $1,800 to $2,300) and Saskatchewan (+25% or $4,400 to $5,500). However, the increase in tuition fees did not necessarily mean that families or students paid more, as a portion of tuition fees could be covered by federal and provincial student aid programs. Conversely, in Newfoundland and Labrador, undergraduate tuition fees for Canadian students fell in real terms from $2,400 in 2006/2007 to $2,100 in 2018/2019, reflecting a tuition freeze that has been in effect in that province for several years. This drop in tuition fees, combined with a decrease in undergraduate student enrolment (from 14,200 in 2000/2001 to 13,600 in 2016/2017), helps explain why the proportion of university revenues coming from student fees in the province has also decreased. Undergraduate tuition fees for Canadian students also fell in Alberta ($4,200 to $4,100), while there were smaller increases (10% or less) in the rest of the provinces. 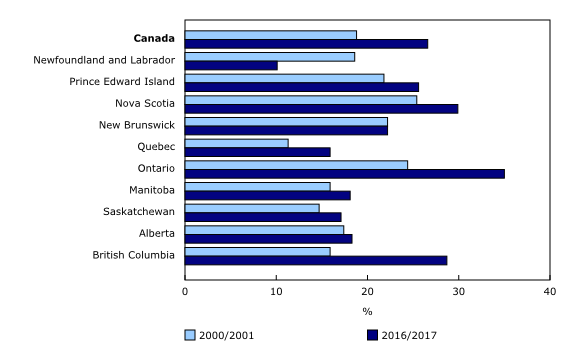 With the exception of Newfoundland and Labrador, international undergraduate tuition fees also rose across the country from 2006/2007 to 2018/2019. These fees almost doubled in Prince Edward Island (from $8,000 to $16,000) and Ontario ($13,000 to $26,000) and rose by half in Saskatchewan ($9,500 to $15,000) and Quebec ($11,000 to $17,000). Conversely, the smallest increases were in New Brunswick (up 10% from $10,000 to $11,000) and Nova Scotia (up almost 20% from $11,000 to $13,000). These increases in international undergraduate tuition fees coincide with an international student population that is increasing at a faster rate than that of the Canadian population. Newfoundland and Labrador, in turn, saw a 6% decrease from $9,300 to $8,700. This fast growing number of international students is an important source of revenue for universities. In 2018/2019, the national average tuition fee for international undergraduate students was $27,200—almost four times the $6,800 paid by Canadian students. The most recent available data from 2016/2017 show that nationally, international undergraduate tuition fees accounted for roughly 30% of total undergraduate tuition fee revenues. This edition of the Pan-Canadian Education also includes information on public and private expenditure on education, post-secondary enrolment and graduation, transitions into post-secondary education and the labour market, and labour market outcomes. The Pan-Canadian Education Indicators Program is an ongoing initiative of the Canadian Education Statistics Council, a partnership between Statistics Canada and the Council of Ministers of Education (Canada) that provides a set of statistical measures on education systems in Canada. The publication Education Indicators in Canada: Report of the Pan-Canadian Education Indicators Program, March 2019 (Catalogue number81-582-X), is now available. The product Education Indicators in Canada: Handbook for the Report of the Pan-Canadian Education Indicators Program (Catalogue number81-582-G) is also available. This handbook provides general descriptions for each indicator, and the major concepts and definitions used, as well as an overview of the methodology, limitations and data sources.